I have been in MANY classrooms as a substitute teacher. Lately, I have subbed in grades 1-3. Most primary classrooms I've been into have some kind of book boxes. The children choose books from the classroom library each week and keep these at their desks. But...they are constantly falling over. They are messy, as the kids stuff unfinished work and projects in them. When it is time for an art or cutting and gluing project, they put them on the floor. Then they trip on them and knock them over. I have been looking for an easy-chair back-book holder. One pin on Pinterest suggested using jumbo-sized book covers. But...what if you can't find them. So, my brain started wheeling. I got out an old pillow case and made a mock-up of one. Fold case in half the fat way to make a crease (or just measure and make mark). Slit the sides of the case from open end up to the half-way mark. Fold the individual flaps up. Fold the hem (now at the top of each pocket down and pin. Sew up the side seems. Place over chair and load with books. My side seems are rough. Please leave a comment as to how you could finish them off nicely. Slit the side seems down to within 5" of the bottom of the pillow case. The bottom of the case becomes the new top of the book holder. It slips easily over the chair. Because cases have those big wide hems, you can fold the hem inside. I left the hem on the outside in the photo above. It was easier to turn inside out folding them inside. Press/ steam these edges down well. Pin the four layers of the new pocket on the outside and sew a 1/2" seam from edge of pocket to the opening end of the case. If you can trim this seam, do so. Then turn the case inside out and sew a new seam on the inside to make a more finished edge. Thanks for this idea!! This just what I've been thinking of, but wasn't sure how to do it. On the part where you cut, I'm not real clear what you mean. Please add a visual or an extra step to clarify. Thanks for sharing!! What size pillow case did you use? Standard, Queen (if there is such a thing) or King? I used a standard size pillow case. 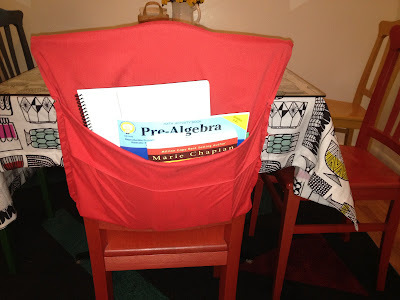 Have you also seen the Pinterest photos of people using stretchable book bag covers?